A new painting by one of last summer’s artists-in-residence at Pine Needles, the historic cabin near Marine on St. Croix, Minn., portrays a highly-visible example of water’s beauty — and challenges — in the state. The subject is also closely connected to the work of scientists at the Science Museum of Minnesota’s St. Croix Watershed Research Station, which owns the cabin and operates the residency program. Greg Lecker recently completed a piece he calls “Mixing,” which he will donate to the Station as part of his 2018 residency. The painting shows a bird’s-eye view of the Minnesota and Mississippi Rivers confluence, in St. Paul, Minn., called “bdote” by the area’s native Dakota people. In the center is Pike Island, called Witi Tanka by the Dakota. Lecker says he is drawn to areas where rivers intersect. The rivers’ curves and forested banks may be familiar to Minnesotans. The brown waters of the Minnesota River flowing into the blue channel of the Mississippi may also be recognizable. The significance of the trees in this work is perhaps easy to miss, but it’s an essential part of the story it tells, and was influenced by conversations Lecker had while working at the Research Station. 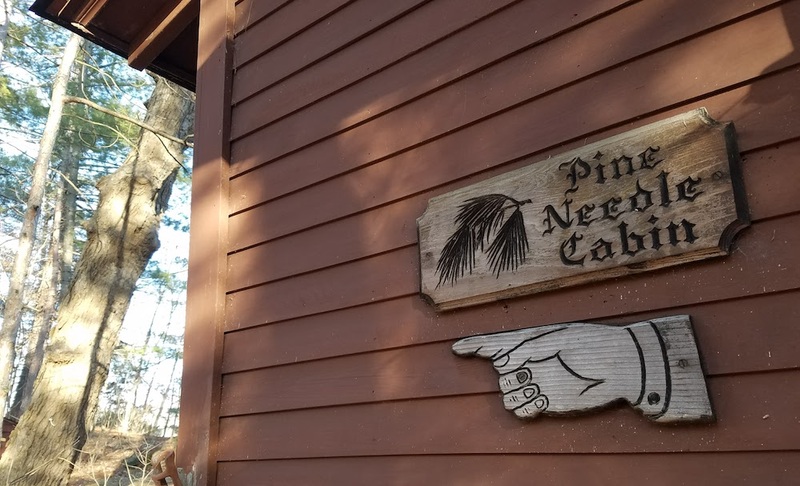 The Pine Needles cabin was built by St. Paul businessman and conservationist J.W.G. Dunn in 1914. His son, James Taylor Dunn, a historian and author, donated the property to the Research Station in 1999. Agate co-founder Laurie Allmann piloted the residency program in the summer of 2000. Now, every summer, three or four artists spend up to a month each living and working on the banks of the Wild & Scenic St. Croix River. When Lecker arrived at the cabin last August, he soon found himself sharing some work and discussing a range of subjects with the station’s staff. A small painting of the Minnesota-Mississippi River caught the attention of director emeritus, Dr. Daniel Engstrom. Engstrom and others on the Research Station staff have studied the Minnesota and Mississippi Rivers extensively, including inquiries into why the Minnesota carries so much sediment. The reasons range from the region’s geologic history, to intensive modern agricultural practices. These insights informed an interesting conversation. “He noted that I had painted the tree foliage as a summer scene but the river flow as a spring scene,” Lecker said. It’s in spring that the rivers carry enough water to create the swirling eddies at their confluence that had grabbed Lecker’s imagination. It’s also in spring that runoff from bare soils in farm fields increases the amount of sediment in the Minnesota River, making the contrast between the two rivers most visible. The fact that most corn and soybean fields remain bare until May has a serious impact on the water cycle, meaning much less water absorbed by plants, and more heading downstream. 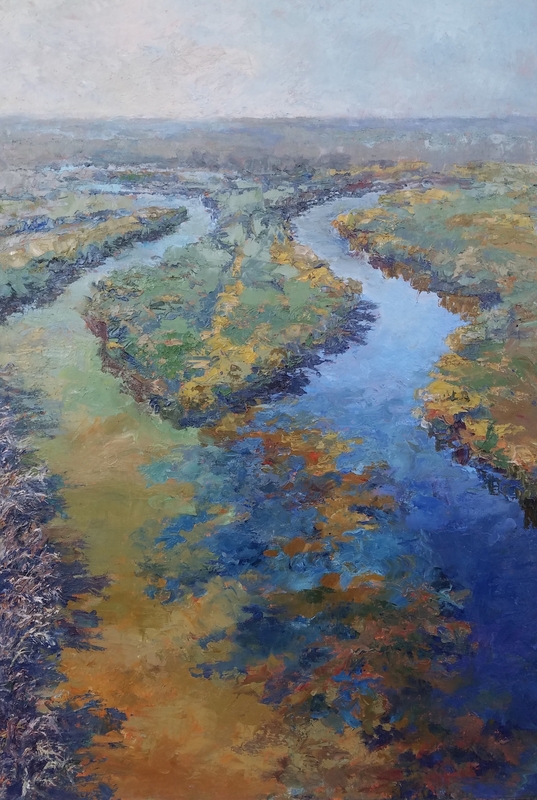 “In the larger work, I chose to paint the lower left-hand mass of trees as leafless to illustrate a more accurate ‘cause-and-effect’ between landscape and river flow,” Lecker explains. Research Station scientists have used innovative techniques to determine how this happens, including identifying how higher flows erode stream banks, carrying more soil into the Minnesota, much of which is eventually deposited downstream in Lake Pepin. In this painting, though, Lecker was most interested in what it looked like when the waters meet. Some of his other work has a stronger environmental angle, but he says he simply enjoys the chance to convey the beauty of the confluence. The painter started work on the piece in early January, with an audience watching and asking questions. He hosted a demonstration at the Hallberg Center for the Arts in Wyoming, Minn., and in two-and-a-half hours, got most of the canvas covered. Lecker working on the piece at the Wyoming Center for the Arts. He did this while explaining his process, and answering questions. He said it made it challenging, and rewarding. “I value teaching because it nets me the greatest mastery of a subject. Teaching is an active way to learn; and it involves auditory, visual, and kinesthetic channels of learning,” Lecker says. The high-flying perspective was one of the more challenging parts to get right. Making the landscape look “flat” was difficult, Lecker says. Lecker does much of his work on location, in the outdoors. Even if he doesn’t actually do the painting under an open sky, his studio work is based on his careful studies of light, form, and other elements. It’s a little like researchers studying sediment cores or water samples to get real-world data about how lakes, rivers, and watersheds work. “Direct observation is used by both artists and scientists,” Lecker points out. 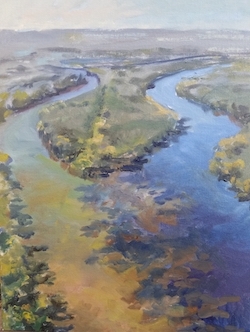 The artist traces his observations of the confluence back to 2005, when he took a Minnesota Master Naturalist course at Fort Snelling, overlooking the area. He later got a view from the water while kayaking with friends as part of the Friends of the Mississippi River’s fundraiser, the Mississippi River Challenge. Lecker will offer an outdoor painting demonstration (plein air) in front of the Marine Village Hall (or in the gazebo if it rains). Drop by and stay for ten minutes or the full two hours. Follow Greg Lecker at https://www.greglecker.com and on Facebook, Instagram, Twitter.